With the Titan Axle Barbell you can keep your lifting regimen and change your bar to achieve more results in the gym! Bust out of a slump or change up your lifting focus with the 1.9" diameter Axle Bar. The 1.9" diameter fat grip taxes your grip strength and forearms while still working common muscle groups during bench press, deadlift, clean and jerk, curls, and many more. - Great substitute for a standard Olympic barbell. - Makes lifts more challenging than a standard bar. Don't up your weight and risk injury! - 5 ft in total length with 8" of loadable sleeve length. 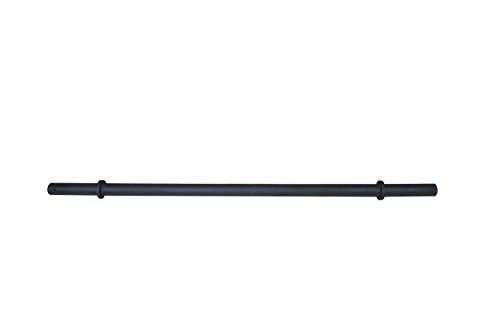 - Grip and sleeve diameter: 1.98"
- Loadable sleeve length: 8"
Great substitute for a standard Olympic barbell. Makes lifts more challenging than a standard bar. Don't up your weight and risk injury! 5 ft in total length with 8" of loadable sleeve length.